Type of book: Paperback, 128 pg. Book size: 10.25 x 8.5 in. In these recent years, interest in the cars created by Shelby-American has increased dramatically. Good Shelbys are getting harder to find each year, and their values continue to rise dramatically. A.C. Cobras--with just over 1,000 made--are becoming impossible to find. The result is that clones have appeared of each and there is intense competition among replica owners to see whose replica will end up being most faithful to the originals. 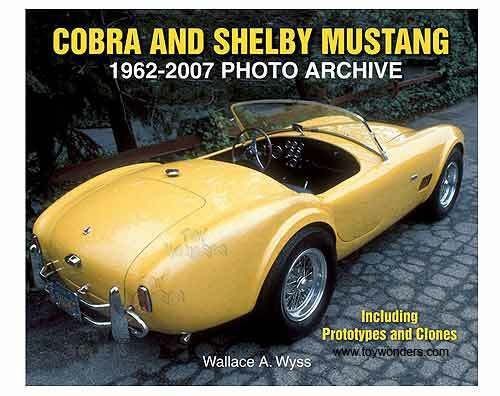 This book Cobra and Shelby Mustang: 1962-2007 Photo Archive shows not only the originals, but also shows in detail the creativity shown by replica Shelby and Cobra owners in modifying their cars in an attempt to capture the spirit of the originals. Not left out are the replica Cobras and Shelbys sold by Shelby himself. Any enthusiast who reads this book cant help but be infused with the spirit and enthusiasm that pervaded the Shelby-American plant from 1962 to 1967--their 5 years vault from relative obscurity to fame and glory that persists forty years later. Fords new 2007 Shelby Mustang GT500--developed with Carroll Shelby back on board as consultant--is also covered. To see more automotive themed books (click here).